Morning Edition listeners will have noticed this week that the newscasts, or headlines, have moved around. Newscasts had aired each hour at 1 minute after the hour and again at 19 minutes and 42 minutes after the hour. Now, while there is the same amount of newscast time, it is grouped in just two breaks, at more intuitive times at the top and bottom of the hour — as was the case for most of Morning Edition's nearly four-decade history. The newscast changes are the most noticeable part of the rearrangement to the internal "clock," or format, that governs the newsmagazine. The bigger significance in the adjustments is the potential that the changes unlock, including allowing for two slightly longer blocks of uninterrupted news time within each hour. Most notably, the news block that leads off the hour will gain a minute for stories and interviews, for a total uninterrupted time of 11 minutes and 29 seconds. 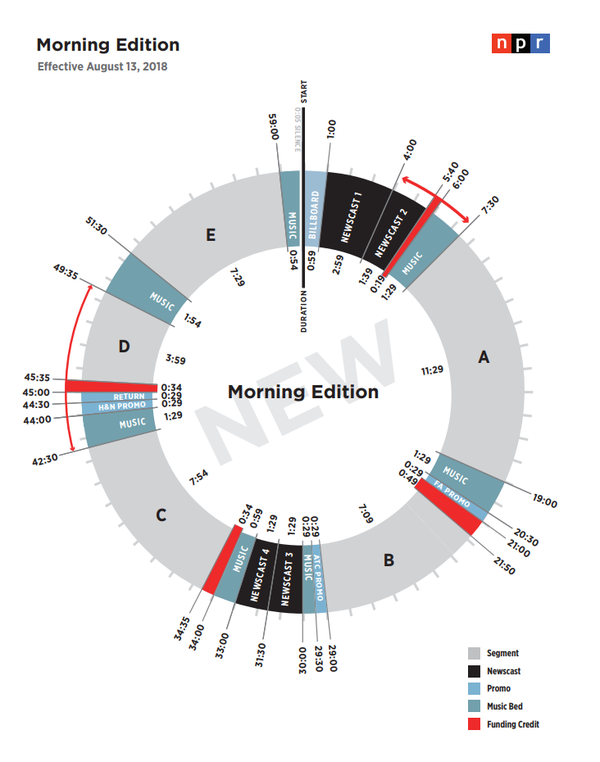 The last time NPR changed the Morning Edition clock was in November 2014. A spike in listener complaints followed; listeners told my office that the new format felt choppier and more commercial (the amount of sponsorship time went up only marginally, but it sounded like more, given all the break times). "The hour doesn't really flow," Christopher Turpin, NPR's acting senior vice president for news and editorial director, acknowledged earlier this summer, before the change. "We hope that this will be a more satisfying listening experience," he said of the new format. Moreover, the 2014 move was not positive for NPR's journalism, in my opinion. Because of the way the breaks fell, individual interviews and reported pieces had to be shortened. One of the hallmarks of public radio has always been that it had time to go more in-depth on subjects. The 2014 change was made, under a previous management team, because there was a belief that listeners wanted to tune in and not have to wait to hear the news headlines, Sarah Gilbert, NPR's acting vice president for news programming, told me. But "news consumption habits are changing very rapidly," Gilbert said. New evidence shows the audience is increasingly getting headlines from mobile phones, news alerts and social media. So the new clock will offer headlines, but then quickly follow with content that provides "deep dive, context and deep reporting." Turpin said the change "will certainly give time for that extra question that makes the difference or the extra piece of sound." On Monday's show, the first under the new clock, listeners heard a just-over-five-minute reported piece from Deborah Amos on how some activists are using the courts to attempt to hold Syrian President Bashar Assad and his regime "accountable for well-documented and widespread accusations of murder and torture." That kind of complicated (and sound-rich) story — the kind of storytelling that makes NPR such compelling listening for so many people — will be easier to get on the air with the new clock, Gilbert said. "Basically, we're hoping to deliver more, and more smoothly, on the big stories of the day," Gilbert said. One caveat here: Some public radio stations switch things around because they produce lots of local news programming that they fit into NPR's shows. As a result, the schedule listeners hear will vary by location. But Turpin told me the newsroom believes the changes will lead to a better integration of local and national content. The changes are expected to have another outcome that hopefully will become apparent to listeners, as well. With slightly more time for individual interviews, the hosts doing live interviews will theoretically no longer find themselves cutting off guests mid-thought because they have run out of time. "It's something we have been struggling with under the old clock model; there wasn't quite enough room to finish that arc" of a conversation, Gilbert said. "The new clock should make that easier." From the mail to my office I can confirm that the interruptions drive listeners nuts. I'm sure some conversations will still run long — it's live radio, after all — but here's hoping the new clock indeed makes abrupt endings less frequent.